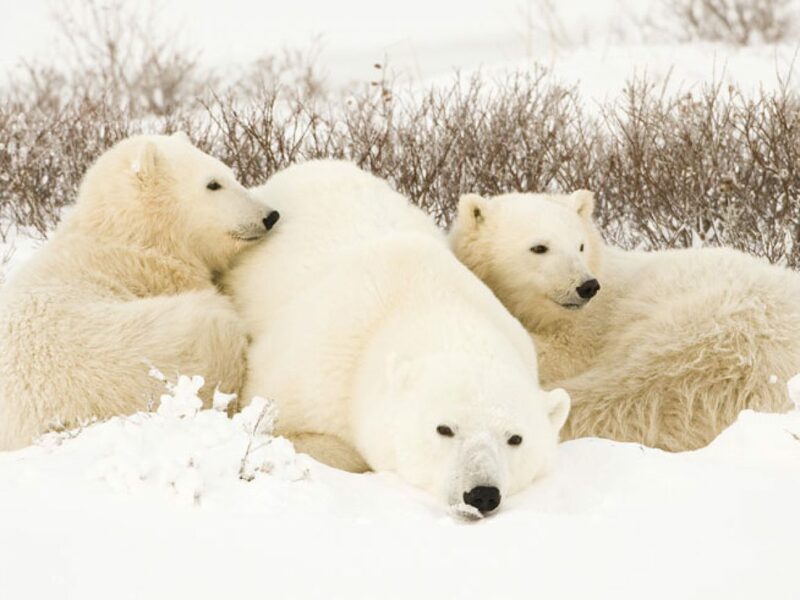 In October and November, up to 1200 polar bears gather on the tundra near Churchill in Canada. 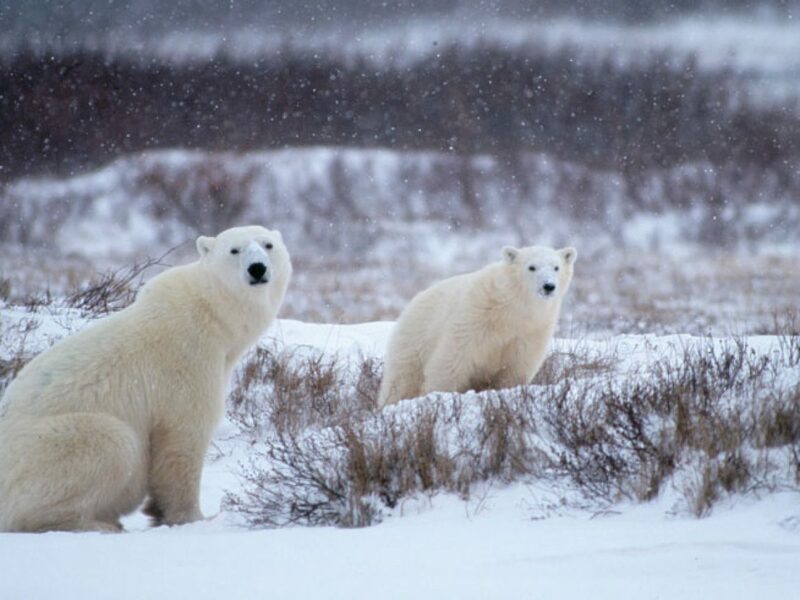 Award-winning travel writer and photographer, William Gray heads to Churchill with Discover the World to catch a glimpse of these majestic mammals. 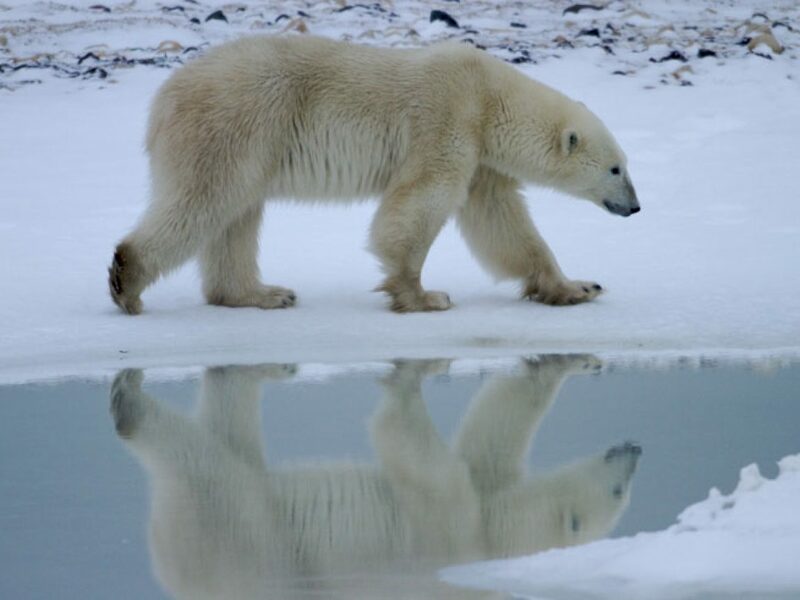 A fleeting glimpse of black fur bumbling across a road in Newfoundland, old grizzly tracks in Alaska and a distant view of a polar bear patrolling pack ice in Spitsbergen. 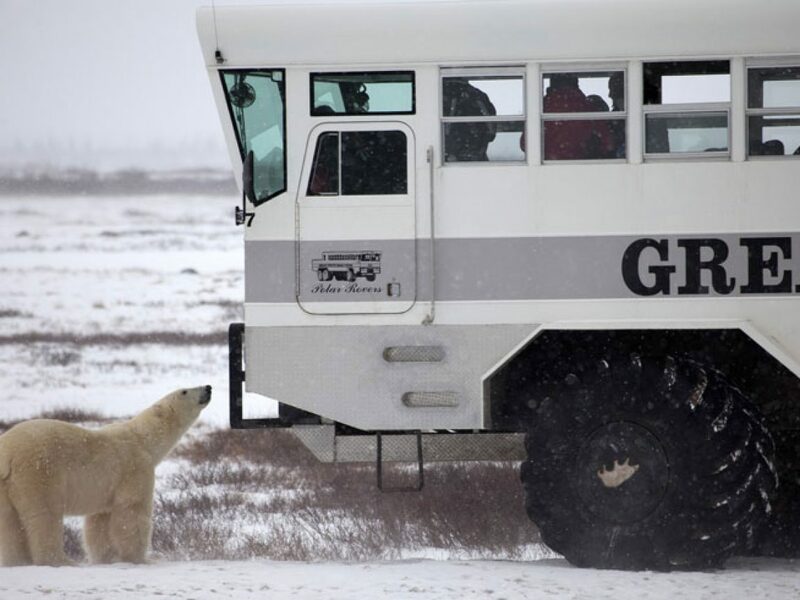 Bears have always proved elusive for me, so last October I decided to narrow the odds and visit Churchill – the best place in the world for an encounter with the ice bear. 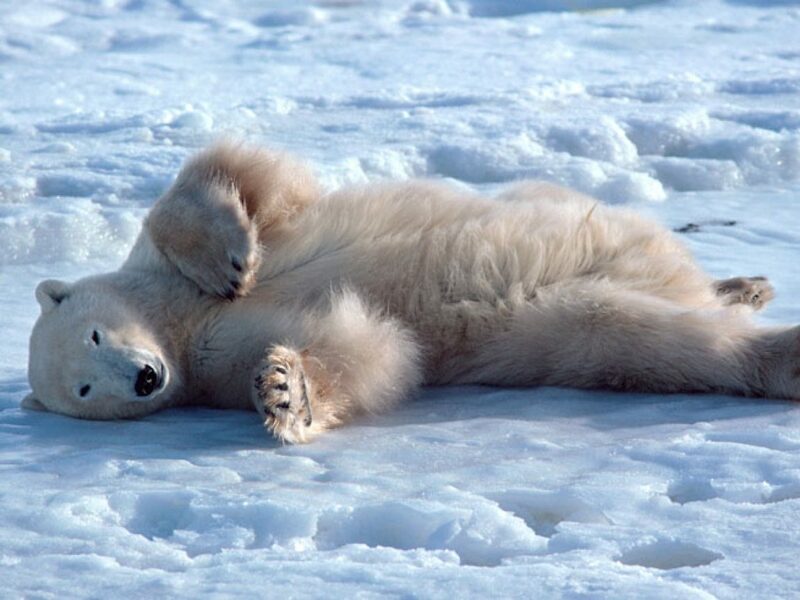 Polar Bears can weigh 600kg and sprint at over 25mph. They are fearless, powerful hunters that can smell you coming from miles off. That’s why I’m in a giant-wheeled ‘snow bus’ that provides a safe vantage from which to observe these magnificent beasts. Timing is crucial though. The peak period is October-November when they congregate near Churchill, a Canadian frontier town rubbed raw by frigid winds that howl across Hudson Bay. 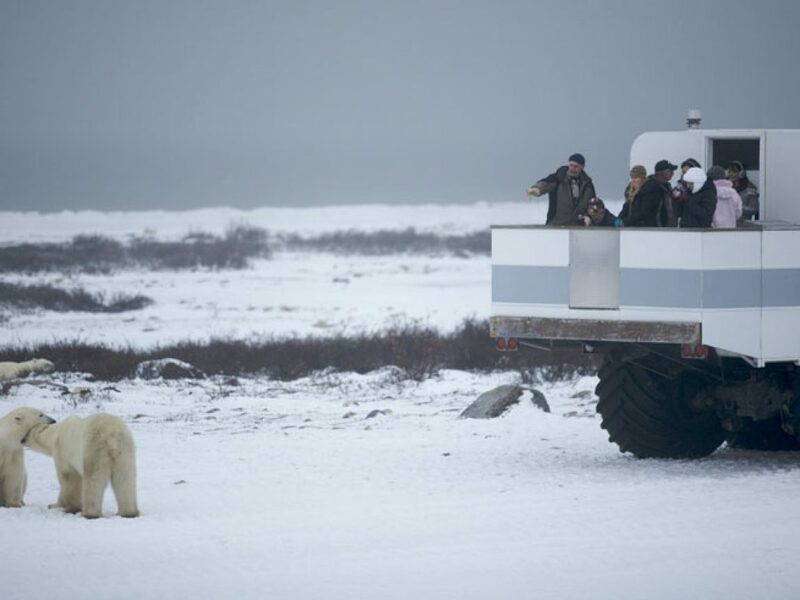 Our polar bear safari sets off at a glacial pace, the buggy creeping through a tundra landscape of lichen-blotched rocks and wind-pruned shrubs. We splash through shallow lakes and crunch over the shingly ridges of glacial eskers, always following rough tracks so as not to damage this fragile habitat. It takes a good half-hour to reach the shores of Hudson Bay (2km away) where a northerly wind has white-ribbed the sea and piled spume against huge drifts of kelp heaped along rock-strewn beaches. It’s a harsh environment, particularly during late autumn before the first snows have smoothed things over. Tossed around by the wind like looser refuse sacks, ravens twist and turn; a lone tundra swan hunkers down in a pond and, briefly, we spot a peregrine falcon scything above the tundra, scattering willow ptarmigan through a patch of dwarf birch. Our first polar bear is dozing on rocks behind the beach. The buggy edges to within 12m of him, but the bear is not bothered by our presence. He barely glances towards us before turning his attention to a full pedicure of his forepaws. Grooming finished, he yawns, rolls over and goes back to sleep, oblivious, it seems, to the dozen or so pairs of human eyes transfixed by his every move. After all, to him it’s just another day waiting for the bay to freeze over. You can follow in William’s footsteps on our Classic Polar Bear Adventure, which can be added on to many of our Canada itineraries. 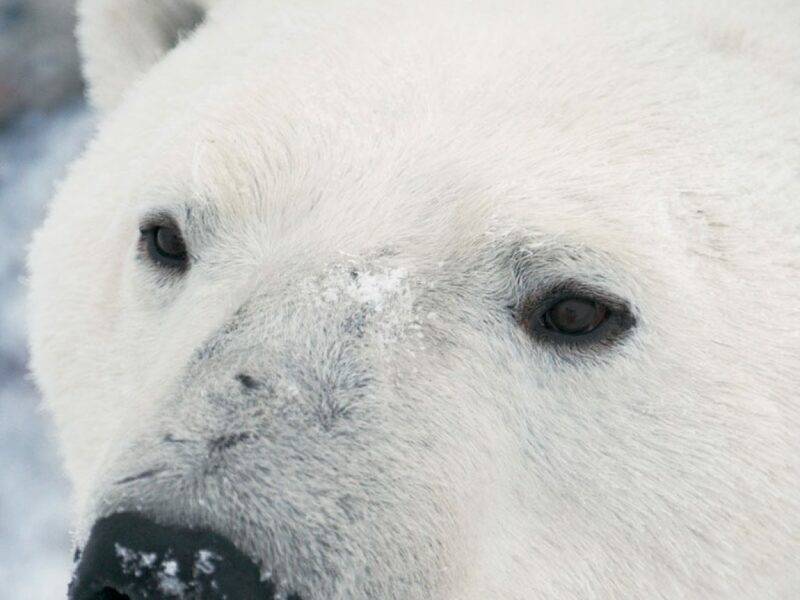 For help and advice on planning your perfect polar bear adventure, send an online enquiry or speak to one of our Travel Specialists today. 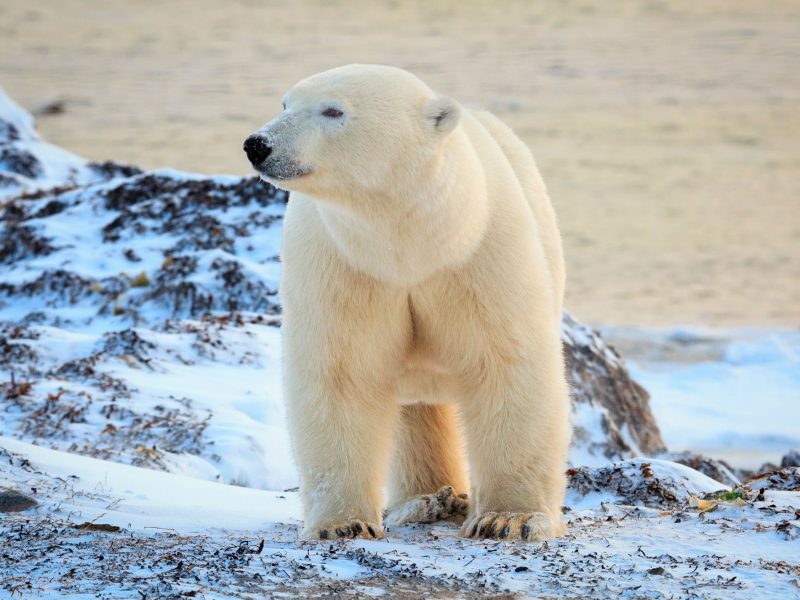 Polar specialist, Gary, sailed around Spitsbergen aboard the M/V Plancius in search of polar bears. Whatever’s on your wildlife wishlist, I think I may have found the perfect holiday. From puffins to polar bears, koalas to king penguins, there’s nothing like an encounter with a truly wild animal to make your heart race and put a big grin on your face. 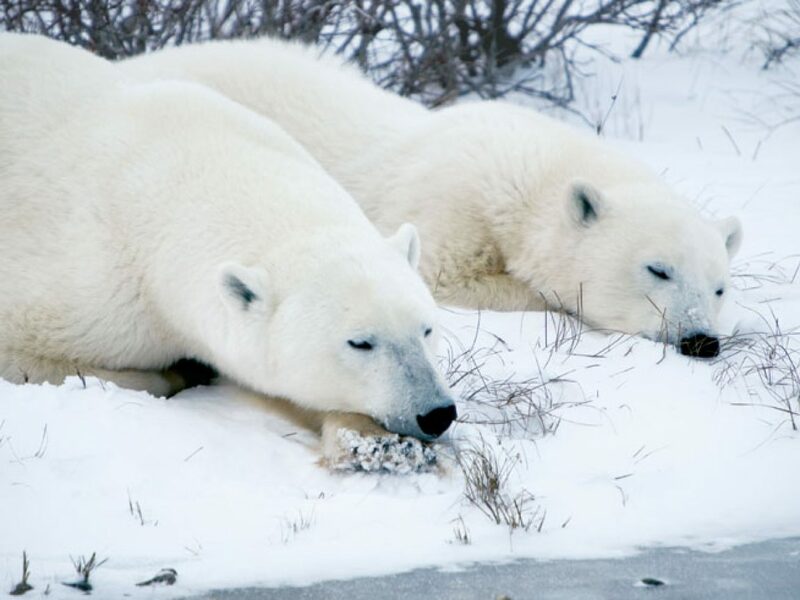 Churchill, on the edge of Hudson Bay in northern Canada is known as the 'Polar Bear Capital of the World' - Pam discovers if it lives up to its impressive name.